I have known Paul and Fi for a few years now and been out to see them in Chatel every winter since. My visits however tend to be for just a few days and I have never done the full Rider Social experience as such as stayed with them for a whole week – as most punters would. Feeling the need for more snow time and a holiday I booked myself and some mates in for a week. We were picked up on time, dinner was ready when we got to the chalet, the food was amazing. The chalet is beautiful with everything you could need. Next morning breakfast was great (everyone loves eggs benny) and our lift passes were waiting for us. Part of the experience is the fact that Paul and/or Fi come riding with you a lot of the time. That local knowledge is so essential for having a great day. Knowing where to go depending on the conditions can make all the difference. 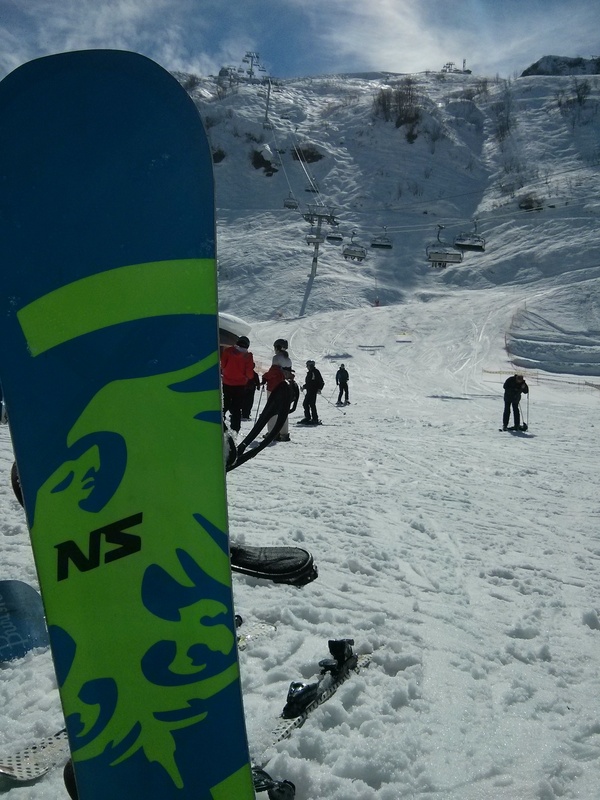 It turned out to be a week of classic spring riding with fast pistes in the mornings to please the skiers followed by more fun for boarders as the snow softened throughout the day. Steve and Jude from the Sick and the Wrong in Keswick were also in town for a few days. It is always a lot of fun getting to know people who you have a business relationship with a little better in a more relaxed setting with the pressure of deadlines all over. If all retailers had as much passion and knowledge as these guys the world would be a better place. The week had a bit of everything! The Portes du Soleil is a massive area and we covered a lot of ground. We did most of the runs in Chatel, Super Chatel, Margins, Avoriaz, Champery, Les Crosets. We didnt bother with Morzine or Les Gets due to their lower altitude. As well as covering a lot of pistes we played in the Stash, and the park in Les Crosets, and did a couple of little hikes to access extra terrain. This variety in riding had a lot to do with riding with people who knew the best places to go. The weather was scorching! Preventing sun burn and dehydration required a little thought. After a couple of days I resorted to wearing a bandana to protect my neck. It is such a nice time to go away – not too busy, pretty comfortable conditions, warm enough to chill out on the slopes etc. Shame we missed the much needed fresh dump of snow by a week! My board for the week was the Never Summer Proto HD – that thing never lets me down!